Hijikata Toshizo Museum (土方歳三資料館) is one of the Shinsengumi Museum located in Hino. Mr. Hijikata is the vice commander of Shinsengumi and one of the most popular Samurai in Japan. This museum is located in his descendent house where also he grown up. In the museum, there are many his Samurai sword"和泉守兼定, izuminokami kanesada", armers, forehead metal plate, practice sword of Tennenrishinryu, Tennenrishinryu certificate, letters, poems, and many more his items. Hijikata's Samurai sword exhibits only on May for commemorated the anniversary of his death. Toshizo Hijikata (土方歳三) is the vice commander of Shinsengumi. Until he starts Shinsengumi, he was grown up in this place in Hino. When he was young he young, he worked for drug salesman travels around Tokyo. In this time ,he was also training his fighting style with many Dojo in Tokyo. 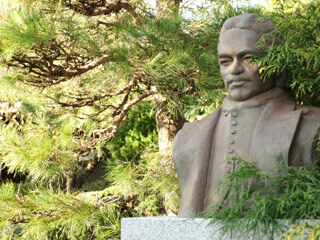 In the early 20th, he joined Tennenrishinryu and meat Isami Kondo who is the commander of Shinsengumi. He was not born in Samurai, but he has strong will to become the real Samurai. Kondo and Hijikata started from country sword style to become one of the most famous and strongest Samurai force "Shinsengumi." because they believed their sprits and strength of their swords were the best in the End of Edo period. Once he become real Sumurai, he had kept fighting until the fall of Tokugawa Shogunate. He said "He will fight wherever there are war and he can fight for the shogunate." He died in Hokaido war. He was not only strong Samurai with the sword, but also great General lead his soldiers always win. He was not real Samurai because he was born in farmers, however he become the most famous Samurai in the history of Japan. No other Samurai fought as much as Hijikata. When he died in the battle, Tokugawa Shogunate has finally fallen, and it was also the sigh of the end of Samurai period. Toshizou hijikata is the last Samurai with the real Samurai Sprits and proud. Those his sprit, soul and proud of Samurai are still in his sword "和泉守兼定, izuminokami kanesada." Museum is managed by his descendent. Hijikata's Samurai sword, armers, forehead metal plate, practice sword of Tennenrishinryu, Tennenrishinryu certificate, letters, poems, knifes, spears, drug box, and many more items are exhibited. You can see scars on his armers and forehead metal plate so that you can imagine how he was fighting in the period. His original house was broken and rebuilt in the current houses. However, many memorial things like house masts, which Hijikata was practicing Sumo when he was young, are built in the museum. His Samurai sword "和泉守兼定, izuminokami kanesada" exhibits only on May for commemorated the anniversary of his death. Check out their official web site for exact date. When you see his practice sword of Tennenrishinryu, you can easily imagine why they are strongest Samurai force. There is no parking. No photo is allowed in the museum.